With L0 being the wavelength of f0. 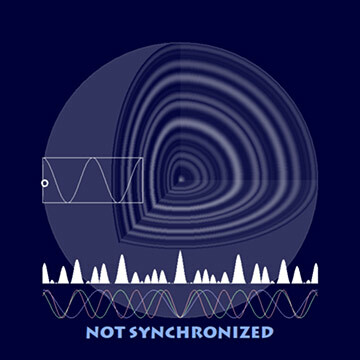 This means that the synchronized field produces an external (“2-theta”) oscillation with twice the frequency of the internal, nominal phase wave. In physics terms, this breaks the symmetry of the field. The amplitude (top-top) of the 2-theta oscillation, B, is apprx. 4% of the ground level A. The latter in physics is hypothized to be the Vacuum Expectation Value (VEV). Note: the standard use of the letter Phi for the field as well as for the Golden Ratio is mere coincidence. Either way the uppercase Φ refers to the field, and lowercase φ refers to the scaling ratio. The individual phase waves Φ0, Φ1 and Φ2 are shown at the bottom, with the absolute value of the composite wave ∏Φn above it.The purpose of the model is to show the synchronized field’s “2-theta” wave A + B cos (2∙θtp) in a glance. For that purpose the ground level A is filtered out, and gain B is normalized, say from 0 to 1, so that the synchronized V(Φ)norm ≅ cos (2∙θtp). In the animation this is the total white area under the curve of the composite wave. The model can be seen as a purely manual spherical projection of ∏Φn "seen from above”, whereby lighter colors indicate higher peak levels. The final rendering merges the composite wave with the integral potential through the multiplication ∏Φn∙V(Φ)norm, for each ∆x. The sinusoïdal segment left from the centre traces the ideal “2-theta” wave, for easy verification and comparison. 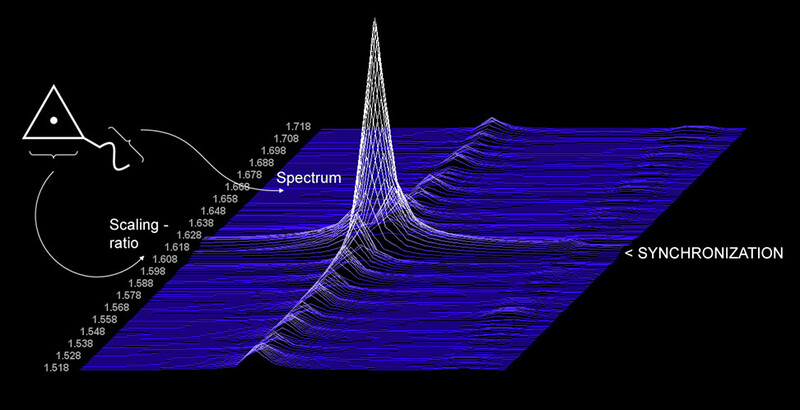 Waterfall power spectrum of the "2-theta" wave generated out of the synchronized field, for axiomatic scaling ratio's ranging from apprx. 1.5 to 1.7. 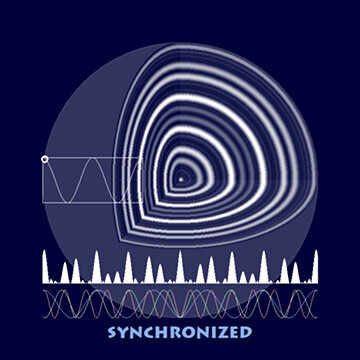 Exactly at Golden Ratio the spectrum peaks, proving the unique resonance point.